"...John Schroeder, an undertaker native of this city residing 527 Elysian Fileds [sic] Ave. who hereby declares that Kenneth Raymond Fauria (white) a native of N.O. La. aged 1 years departed life this day (Dec. 13th, 1940) at No. 931 Frenchem St. in this city. "Cause of death Influenzal bronchitis, Congenital heart since birth. "Deceased was the son of Frederick C. Fauria and Myrtle LaCoste, both natives of N.O. La." [S83] US-Louisiana State Death Certificates, FAURIA, Kenneth Raymond - 13 Dec 1940 - Vol 215, Pg 1230 (Reliability: 1). 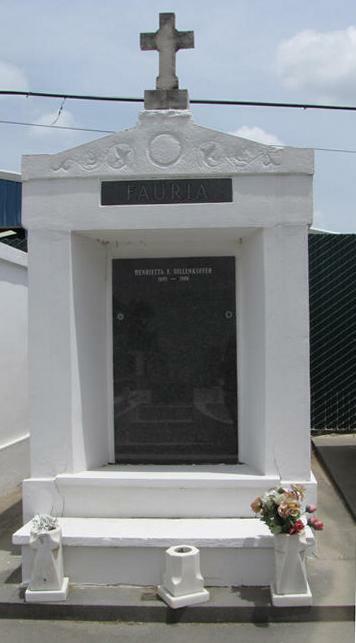 [S334] US-Louisiana-Orleans Parish-New Orleans-St. Louis Cemetery #3 Fauria Tomb ownership records, Saint Louis #3, Fauria, Kenneth R. Burial 13 Dec 1940, Position V2. (Reliability: 3).